This year's 2011 National DOG has come and gone. Thanks to all who attended and made it a success. Next year's 2012 National DOG will be held at Canton TX -- make plans now! The 8th Annual National DOG was held in the picturesque community of Wooster, OH, within the surrounds of the largest Amish community in the world, on July 8-10, 2011. Hundreds of kindred Dutch Oven enthusiasts from all over the US and Canada came together to share their knowledge, food, and friendship at this annual event. All experience levels welcomed. Training sessions and demos were held. Vendors were welcome. Since this is considered a private "club" event, all attendees were pre-registered (see REGISTRATION below). Come to the 2011 National DOG in Ohio, whether you come a few days early or stay late, you can make Wayne County Fairgrounds your home base, take it easy and appreciate the slower pace of life around you -- and yet there's plenty of things to see and do to make this Dutch oven gathering a memorable vacation. You don't want to miss this one -- it will be years before it comes east of the Mississippi again. These are Gilden brand t-shirts, 6.1 oz pre-shrunk cotton. 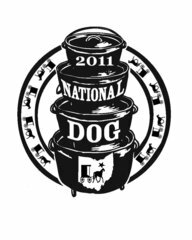 T-shirts, bags, and aprons must be pre-ordered for distribution at the National DOG. SORRY -- NO MORE ORDERS ARE BEING ACCEPTED. 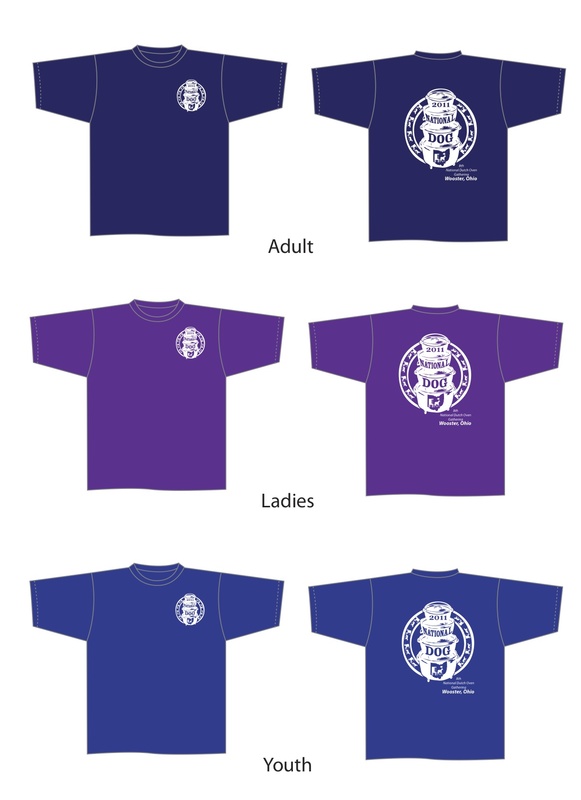 LAST DAY to accept orders for merchandise was MAY 15, 2011. No extras will be available. ﻿Due to insurance considerations, no admittance without a pre-registration. Camping Fees: $12/night. No reservations -- there is an abundance of spots to set up. Restrooms buildings and showers available. CAMPING FEES ARE TO BE PRE-PAID WITH REGISTRATION. If you decide to extend your stay after you arrive and you've already sent in your camping fees, pay the extra nights' difference directly to "wagon master" Ray Grodek, CASH ONLY, when you arrive. 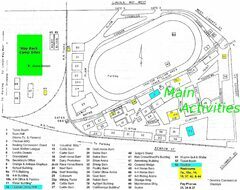 The Dutch Oven Gathering events will all be held up in the front towards the Fairgrounds office -- there's plenty of space to set up camp near where the action will be. If you wish to camp up front where the main activities will be held, there's plenty of electrical connections about (quite a few 15 & 30amp, and an occasional 50amp), but you will have to share water hook-ups (be prepared). UPDATE: There are now designated campsites as mandated by Ohio State Laws. Each campsite has water. Electrical hook-ups are available at many sites but not all. Again, NO RESERVATIONS on specific sites, as there are plenty of camping sites available for our National DOG. Be prepared to run additional lengths of hose or electrical cords if needed. There are also 100 "dedicated" gravel campsites in the 'way back area complete with individual water and electrical hook-ups, but you'll have to come up front for the festivities. There's a dump station back there too. 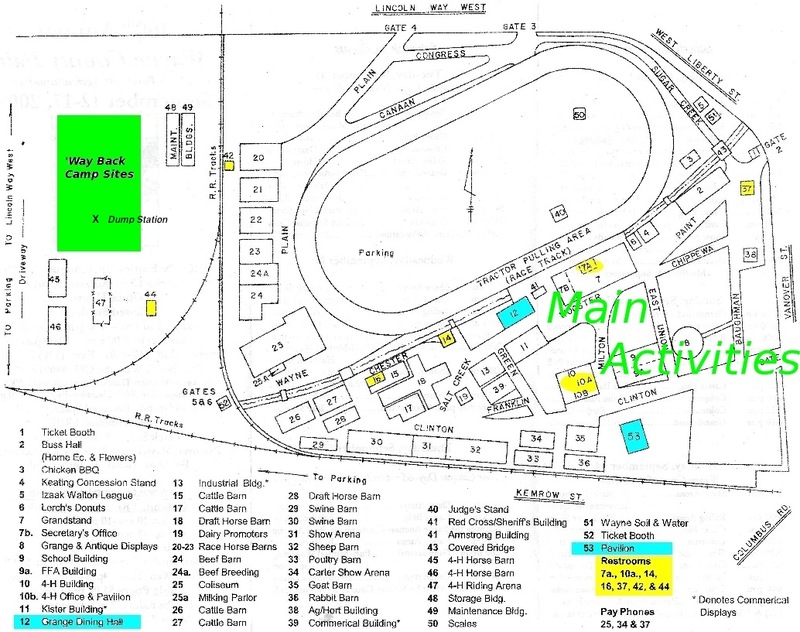 UPDATE: Only one dump station is now available on the fairgrounds, and it is located in the 'Way Back Camping Area. Sorry, no ground fires. Campfires/bonfires are permitted provided they are held above the ground in a raised fire box. Coming a few days earlier or staying later? No problem! $12/night rate to be paid to "wagon master" Ray Grodek for the days before and after the DOG, but must be paid by the end of the DOG. Due to other local events occurring that week, HOTEL LODGING is in HIGH DEMAND! Make your reservations now. ...plenty of B&B's around. Nearby Holmes County is the largest Amish settlement in the US; tourism is very popular in this community.